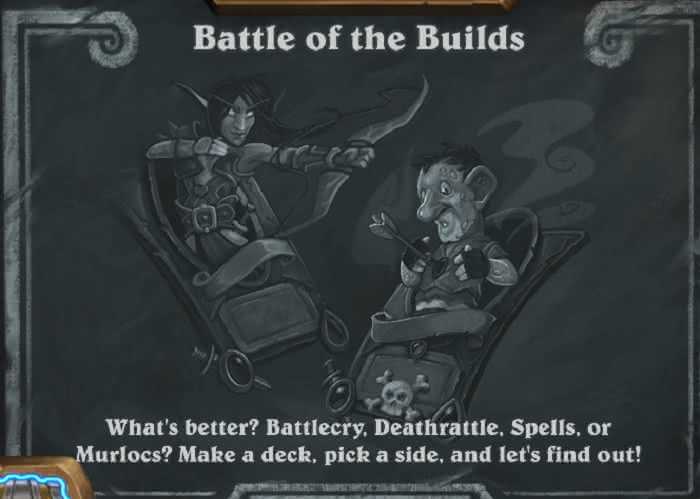 This week's Tavern Brawl is called Battle of the Builds. In this Brawl, you create your own deck as normal, but at the start of the game you choose from four different bonuses that remain active for the entire game. The Brawl features an idea that Ben Brode has mentioned before as something that beginners find attractive, which is the option to build around an idea. The four different bonuses are pictured below. It is possible that Blizzard are using this Brawl to test effects that remain in effect for the entire game as that is not a mechanic that we have yet seen in ranked play. It would be cool if this is for a future expansion. Speaking of..I wonder when they'll be releasing a new one. Hopefully we get a hint soon. My best guess would be late February or early March.